If you’re interested in commercial real estate investing but don’t want the hassle of managing your own properties, then Equity Multiple real estate may be a smart investment option for you. Commercial real estate encompasses office buildings, retail space, and other non-residential properties used to generate a profit. Traditionally, investing in commercial real estate was an arduous process. The capital requirements, time, and expertise involved were more than the average investor has readily available, leaving these opportunities out of reach for most. How does Equity Multiple Work? When can I expect a return on my investment? 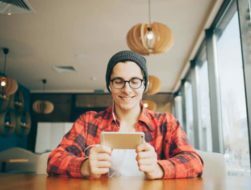 Are my Equity Multiple investments secured? What’s the difference in investing with Equity Multiple versus a REIT? Who Should Invest with Equity Multiple? Equity Multiple real estate is changing that narrative. Using technology to their advantage, the team at Equity Multiple created a space where investors can access a diversified commercial real estate portfolio backed by a leading national real estate company. In this Equity Multiple review, we’re going to look at how the company works, the pros and cons of this online platform, and how to decide if it’s the right fit for you. Best for: Accredited investors with enough time to vet and understand individual investment projects. Equity Multiple isn’t for the beginner investor. However, for experienced real estate investors who can bear more risk for the potential of a higher return, Equity Multiple’s offering is a hard one to beat. Equity Multiple is an online platform that provides accredited investors access to commercial real estate investment opportunities. Charles Clinton and Marious Sjulsen founded the company in 2015. Prior to Equity Multiple, Clinton worked on over $10 billion in transactions as a real estate attorney. His legal expertise combined with Sjulsen’s 10+ years of real estate experience provided the foundation for what is now a leading online real estate investment platform. Several factors set Equity Multiple apart from its competitors. First and foremost, Equity Multiple is backed by a leading national real estate company, Mission Capital Advisors. This partnership allows Equity Multiple (and its investors) access to quality deals from experienced real estate lenders and sponsors across the U.S.
With more than $60 billion in real estate transactions under its belt, several of Mission’s principals sit on the board of Equity Multiple and help inform the company’s investment strategy. Mission’s leaders also regularly invest in Equity Multiple deals, putting their own “skin in the game,” and incentivizing further due diligence. Another differentiating factor for Equity Multiple is the company’s focus on institutional commercial real estate investing. Some online real estate crowdfunding platforms focus on single-family projects. Others solely offer debt deals or funds. Equity Multiple, on the other hand, specializes in large commercial projects, providing a mix of debt and equity offerings. Equity Multiple offers investors the chance to invest directly in specific projects. This is a different model from some of the other online real estate investment platforms you may have heard of. Fundrise, for example, offers products that include multiple properties. By investing in an eREIT or eFund with Fundrise, you receive some level of built-in diversification. This is most beneficial for non-accredited investors looking for lower minimum investment opportunities. Equity Multiple, on the other hand, offers a more hands-on approach. Investors choose the specific projects and properties in which to invest, allowing maximum control over their portfolio and the potential for greater returns. Of course, the higher the potential return, the greater the risk involved. That’s why this model is better suited for the experienced real estate investor. Equity Multiple offers three options for investing, each with its own risks and possible rewards. The minimum investment for Equity Multiple offerings starts at $5,000 and varies per project. However, most require an investment of at least $10,000. Sign up through the online portal. Review project details and select your investments. Link your bank account to fund your chosen projects and receive distributions. Verify your accredited investor status and e-sign the paperwork. The user-friendly online platform makes it easy to track your investments. The “My Portfolio” page shows your investment performance over time, and you’ll receive distributions directly to your linked bank account. Equity Multiple also provides quarterly investor updates, so be sure to look out for those for a thorough analysis of project performance. Number of Current Investments 44 across 30 markets This figure is of the Equity Multiple May 2018 investor update. Investment Minimums Varies by project. Minimums start as low as $5,000 but are more commonly $10,000, with additional shares offered in increments of $5,000. Return Potential To date, average net return for all cash-flowing investments is around 9%. This is calculated by Equity Multiple and does not include appreciation and profit from the sale of equity investments. 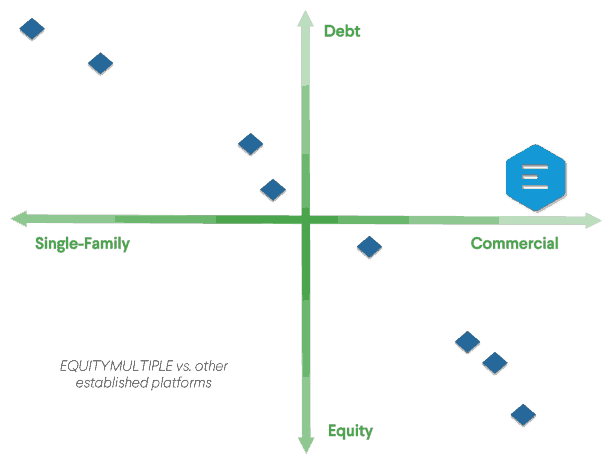 Asset Types Commercial real estate debt and equity. Liquidity Investments are highly illiquid due to the lack of a secondary market. Expect to hold your securities to expiration or until there is a liquidation event. It may be possible to sell your securities through a private transaction, but such an opportunity is not guaranteed. Secondary Market None. Investors cannot buy and sell shares between themselves. Still with me? We’ve covered a lot of ground so far and you probably have a load of questions. Fortunately, Equity Multiple’s site has an extensive FAQ section. That said, we’re going to highlight a few of the most common ones on every new investor’s mind. We’ve already talked about Equity Multiple’s target returns, but when will you start seeing income from your investment? Distribution schedules vary depending on the deal but are typically monthly or quarterly. Return amounts and frequency depend on the type of investments you choose. Debt deals come with a fixed monthly rate of return throughout the term of the loan. Once the deal reaches maturity, you’ll receive a return of your original principal. Preferred equity deals also offer a fixed monthly rate of return. On top of that, you may also see an additional accrued yield depending on the project performance. Equity deals, on the other hand, typically do not have a fixed return. The frequency of cash flow for these projects depends on the performance of the underlying investment. As is often the case with real estate investing, most debt deals on Equity Multiple are secured by the underlying real estate. However, that’s not the case with every investment. Preferred equity investments are not secured by real estate, although they do receive priority payment. That means preferred equity investors are typically entitled to receive a preferred return and principal before the common equity investors or sponsor. Common equity investments offer the highest potential return with an uncapped upside. On the other hand, they also come with a significantly higher risk since common equity holders are generally the last to be paid (after debt and preferred equity investors). Regardless of which projects you choose, every investment comes with risk, and returns are never a guarantee. Be sure to thoroughly review the terms of each project before making your selection. For equity investments, both common and preferred, the sponsor is in charge of overall project management. They may also rely on a third-party company to help manage the property. For specific details, be sure to read the Offering Page for each equity investment. When it comes to debt investments, the lender is responsible for collecting interest and making distributions to Equity Multiple. In either case, Equity Multiple manages the relationship with the lender or sponsor and provides updates via the online platform. That way you don’t have to worry about chasing down your money. If you’ve heard of real estate investment trusts (REITs), then you may know that a REIT is essentially a pool of multiple properties. By investing in a REIT, you’re investing in more than one individual project or property. While this does provide some built-in diversification, it is a distinctly different model than investing with Equity Multiple. For one, REITs offer less transparency. By investing in a pool of real estate assets, you’re less likely to understand or even know what the underlying assets are. Equity Multiple thoroughly vets every individual project and provides investors with an in-depth analysis of each. 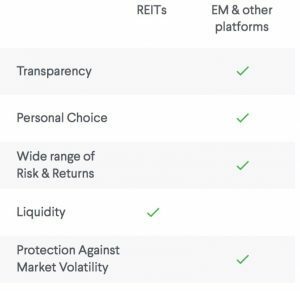 Since REITs are publicly traded, they offer a level of liquidity that Equity Multiple investments cannot. The tradeoff is that REIT shares and returns are more closely tied to the health of the overall market. When the economy takes a downturn, so likely will the value of your REIT investments. While Equity Multiple can be a great choice for the right investor, it’s not for everyone. Due to federal securities laws, only accredited investors can invest in Equity Multiple’s offerings. Keep in mind that investments are subject to holding period requirements. If you need access to your money on your terms, then this may not be a good fit for you. The ideal Equity Multiple investor is past the beginner stages of investing. Since this platform is more involved and allows investors to choose their own specific projects, it’s better suited for someone with past experience investing in real estate with the time and knowledge to understand projects and manage their portfolio. In the past, the commercial real estate market was inaccessible to individual investors. With the backing of a leading real estate company and a technology-forward philosophy, Equity Multiple set out to change that. Equity Multiple provides individual investors access to a diversified commercial real estate portfolio. This allows qualified individuals to invest in real estate classes that were previously out of reach. Each project goes through a rigorous selection process. Only about 5% are chosen and displayed on the online platform. The company’s commitment to due diligence and transparency put them a step above their competitors. 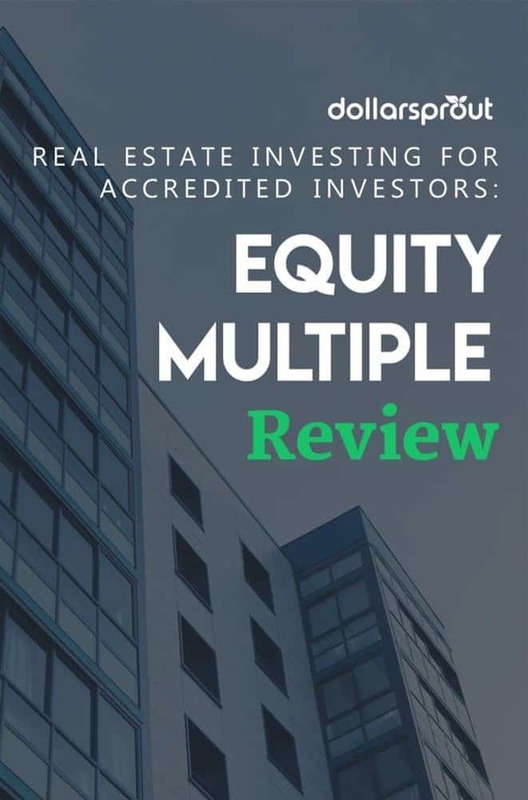 If you’re an accredited investor looking for a simple, modern way to add commercial real estate to your investment portfolio, then Equity Multiple could be your perfect match. Click here to create your account and start browsing projects.